World diabetes day theme for the year 2017 is Women and diabetes – our right to a healthy future.World diabetes day 2016 theme is “Eyes on Diabetes”. All organizations started a campaign to eradicate diabetes. 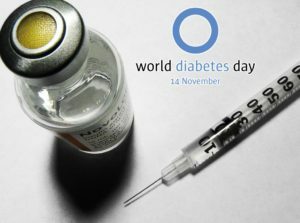 So on this word diabetes day, 2017 join your hands and eradicate the disease. The International diabetes day 2017 campaign will encourage the importance of affordable and equitable access for all women at risk for or live with diabetes. It also promotes self-management education and information they require to achieve optimal diabetes outcomes and extend their capacity to prevent type 2 diabetes. Diabetes is not a very dangerous disease which kills the person immediately, but it slowly affects all organs and makes the person fragile and finally causes death. This diabetes is recorded in the 8th place in the world in disease list. Why this disease occurred? This condition occurred due to the illness of metabolism, when insulin is not produced correctly in our body then we will face the problem of diabetes.